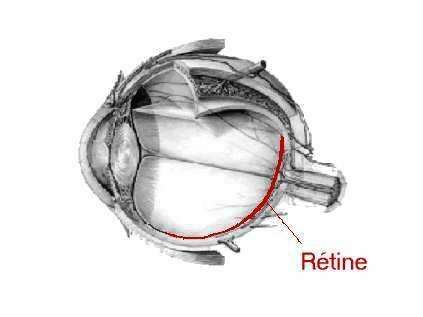 The retina is the main site of vision. It lines the base of the eyeball and mostly formed from photo-receptor cells called rods and cones. The latter analyse the light which arrives after being focussed and filtered by the cornea and pupil. The visual information is then sent to the brain through the optic nerve that is an extension of the retina.